TRENTON, N.J. (AP) — New Jersey prosecutors say they will move quickly to extradite a man suspected of killing his 2-year-old daughter by tossing her into a creek while she was still strapped in her car seat. Twenty-seven-year-old Arthur Morgan III was captured without incident late Tuesday afternoon at a home in San Diego, Calif. The arrest came one week after he allegedly killed Tierra Morgan-Glover during a court-approved visit and then fled the state. Morgan, who could not be reached for comment, had been the subject of a nationwide manhunt and had been featured on the website of "America's Most Wanted." He was being held early Wednesday in California, and it was not yet known when an extradition hearing would be scheduled. 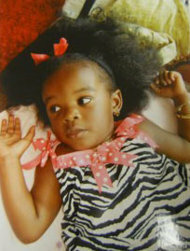 The girl's mother, Imani Benton, called police after Morgan failed to return the child on Nov. 21. She had spent several hours speaking with investigators on Tuesday and learned of Morgan's arrest when she arrived at a friend's home Tuesday night and heard people cheering. "Everybody was outside yelling and screaming — they were like, 'They got him. They got him,'" Benton told the Asbury Park Press of Neptune. "I couldn't get out of the car. I just had to sit and let the tears fall for a minute." Benton said she was hoping that justice would be served. "I hope that my story and my situation can prevent another mother going through what I have to go through," Benton said. "It doesn't matter what a person does in the streets, you never know what they are going through behind closed doors." Steve Jurman, supervising deputy at the U.S. Marshals Service office in San Diego, said Morgan was captured around 4:30 p.m. PST. Jurman said his office got a tip from New Jersey authorities that Morgan might be at the home, and surveillance was conducted there for most of the day. Morgan was then spotted on the home's back porch and, after a brief period where it appeared he might try to flee, Morgan was taken into custody. Monmouth County prosecutor Peter E. Warshaw Jr. praised the efforts of the U.S. Marshals Service and other law enforcement authorities that were involved in the search for Morgan, who is charged with Tierra's murder and also faces charges of child endangerment and interfering with custody in neighboring Ocean County. Tierra's body was found partially submerged in a creek near a roadway overpass in Shark River Park in Wall Township, N.J., about 20 miles north of her Lakehurst home. Her cause of death was listed as "homicidal violence, including submersion in water." At least 13 law enforcement agencies in and around New Jersey participated in the search for Morgan, covering airports, train stations, bus depots, and highway bridges and tunnels. He had an apartment in Eatontown, but had been staying on and off with a friend in Ocean Township, adjacent to Asbury Park. An obituary prepared by the church at which her funeral was held gave the child's full name as Tierra La'Shae Camaya Morgan-Glover, "a bright-eyed little girl with a warm smile." Clergy there said Tierra quickly became known as "the church baby" because her radiant smile and warm personality were so noticeable to anyone who attended services there. They said she enjoyed singing, loved mathematics, and was a quick learner. Shipkowski reported from Trenton, N.J., and Petski reported from Los Angeles.